In January 2014 the Committee for Medicinal Products for Human Use (CHMP) agreed to assess the safety profile for Protelos/Osseor (Strontium Ranelate) on the advice of the Pharmacovigilance Risk Assessment Committee (PRAC) who felt there was an increased cardiovascular risk in patients taking this medicine for the treatment of severe osteoporosis. This assessment stemmed from a study of pooled randomized data of 7,500 post-menopausal women who had an increased risk of myocardial infarction and thromboembolic events due to the use of this medication and who had a current or past history of heart disease, peripheral artery disease and cerebrovascular disease. Upon final review, the European Medicines Agency, PRAC and the CHMP recommended that the drug remain on the market, with the agreement that physicians determine whether their patients are at high risk for heart issues like, uncontrolled high blood pressure, circulatory problems, stroke and heart attack. If a patient does not have any of these heart issues and Protelos is the only medication they can take, they would be able to continue on this treatment with regular checks for cardiovascular disease every 6 to 12 months. If you are taking Protelos/Osseor, be sure to check with your health care provider on the status of this medication with regard to your current and past medical history. If your physician should find that you have any heart disease or circulatory issues, then the medication should be stopped, according to the EMA press release. This announcement on February 21, 2014, comes as good news to those who take this medication, for severe osteoporosis, who do not have a history of heart disease. Patients were worried about this decision because there were no other options to treat their bone loss. Most had already tried other antiresorptives, like bisphosphonates and Prolia ®, and found they had contraindications or could not tolerate them due to other side effects and settled on Protelos, which has minimal side effects in those without a history of heart disease. This treatment will remain for those men and women who have a high risk of fracture and are unable to take other medications that are on the market for severe osteoporosis. According to the EMA, who announced the decision made by both PRAC and the CHMP, the following criteria must be followed by physicians who prescribe this medication to their patients. Protelos/Osseor should be stopped if the patient develops ischaemic heart disease, peripheral arterial disease or cerebrovascular disease, or if hypertension is uncontrolled. For those who are unfamiliar with Protelos or Osseor, it comes in a 2 gram sachet of powder, to be mixed with water and taken well before any food, on a daily basis. There are no postural restrictions with Protelos, as there are with Fosamax, where you must remain upright for 30 minutes after it is taken before any food or drink for the day. Patients are advised to get the recommended daily allowance of calcium and vitamin D3, with the administration of Protelos. If you have issues with mineral metabolism, your doctor should advise you on how to obtain the recommended amounts of these two nutrients. Weight-bearing exercise, lifestyle changes and good nutrient-dense diet, is also recommended for the treatment of osteoporosis. If you have a history of heart disease, and are taking Protelos or Osseor, you will need to discuss your options with your health care provider. There are other drugs available in the European Union, like Fosamax ® (alendronic acid), Prolia ® (denosumab) and Forteo ® (teriparatide). European Medicines Agency. 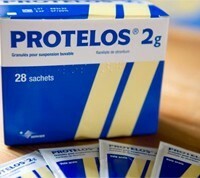 European Medicines Agency recommends that Protelos/Osseor remain available but with further restrictions. 21 Feb. 2014, Retrieved 21 Feb. 2014.